The coniferous forests on the island Bornholm is rich in scandinavian species from the coniferous forests. Goodyerea repens in the right picture is one of these. In the forest at Dueodde one can be lucky to find the var. ophioides with white stripes on the leaves. Listera cordata is another example which also can be found in the coniferous forsts on Bornholm. Species from the plant family Pyrolaceae are also quite frequent in the coniferous forest. 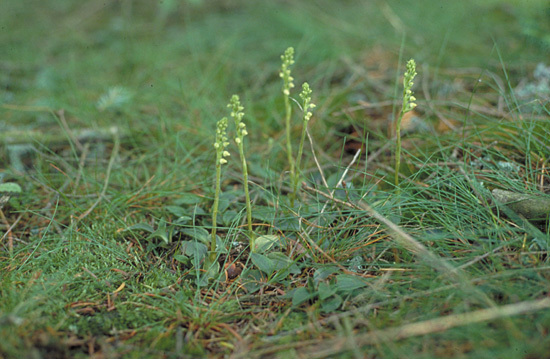 The picture at left shows one of the morre common - Pyrola minor. 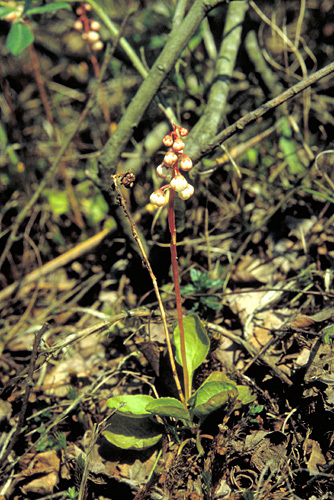 But several of the more rare species can be found on Bornholm as Moneses uniflora, Orthilia secunda, Chimaphila umbellata, Pyrola media and Pyrola chlorantha. Finally there is Linnaea borealis which can be seen is large populations some places in the forests. Back to Samd dunes at the southern tip of Bornholm.